With Europe and the US still feeling the economic and regulatory repercussions of the financial crisis, investment banks are increasingly turning their attention to the booming emerging markets and the fast-growing economies of South East Asia. And if there is one particular spot which stands out in the region, it’s Singapore. While mostly known as “the billionaire’s paradise,” this city-state is effectively turning into an investment banking paradise. There are a few reasons why Singapore has turned into a hub for Asia’s richest (and their money), the most obvious being the city’s strategic location in the Asia-Pacific region. The stability offered by the country’s government is another favorable factor, especially given that this is not always the case with other Southeast Asian nations. 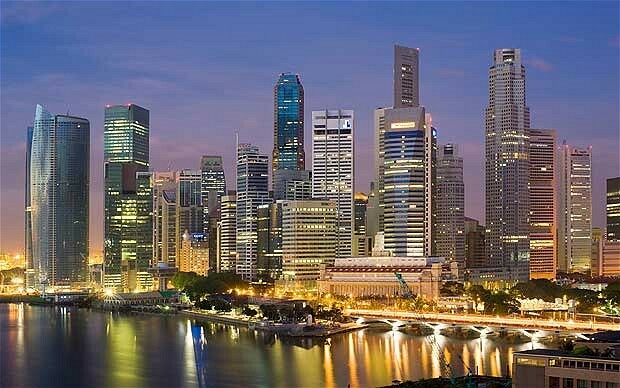 Additionally, Singapore has turned into a tax haven on account of its low tax rate on personal income and tax exemptions on foreign-based income and capital gains. Reuters last year quoted data compiled by PricewaterhouseCoopers as part of its Global Private Banking and Wealth Management Survey as showing that the city is well on its way to dethrone Switzerland by 2015 as the world’s top center for managing international funds amid a global tax crackdown and tighter regulation poised to erode the Alpine nation’s appeal as a tax haven. And last but not least, Singapore has also taken care to make the rich feel “at home”, accommodating their needs with the appropriate infrastructure, including high-end shopping, hotels, restaurants and entertainment. So, with billions of dollars (or rather, billionaires) lying around, it is only natural to have the appropriate quantity of investment bankers to handle all that money. Citi, for instance, has been present in the country since 1902, and as noted on the bank’s website, its Private Bank and International Personal Bank make the company Singapore’s largest banking employer. JPMorgan has also chosen its Singapore office as a hub for its operations in South East Asia, as well as an Asia Pacific head office for a number of business lines and corporate support functions. European giants such as BNP Paribas have also established presence in Singapore, while London-listed Standard Chartered and HSBC have long traditions in the city, with Standard Chartered opening its first office there in 1859, followed by HSBC in 1877. On account of its proximity to Australia, Singapore is also a preferred location for Westpac whose head office in Asia is located in the city, as well as ANZ which opened an office in Singapore in 1974. An interesting survey by financial services recruitment firm Astbury Marsden which made the headlines at the end of 2012 showed that investment bankers in the UK favored working in Singapore rather than in New York or London. It is, however, not only investment bankers that would gladly relocate to Singapore in a heartbeat. The abovementioned tax exemptions are one of the factors which have made the city particularly attractive for private equity firms. Singapore has in fact developed into one of Asia’s leading asset management hubs over the last decade. According to the September 2014 edition of Ernst & Young’s “Asia-Pacific Private Equity Tax Newsletter,” the industry’s assets under management in the city have grown almost fourfold to $1.34 trillion since 2002, while the number of investment professionals has tripled to 3,052 in 2011. And as if investment banking and private equity weren’t enough, Singapore is also well on its way to establishing its own Silicon Valley with the government pumping millions of dollars for early-stage startups. In February 2014, the Wall Street Journal quoted data from Hong Kong-based Asian Venture Capital Journal as showing that venture capital invested in Singaporean tech firms by funds had totaled $1.71 billion in 2013. As is the case with landing a job anywhere in the investment banking industry, you would still have to go through a lot of hoops, including lengthy application and investment banking interview processes before you can buy a one-way ticket to Singapore. You’ll also need to brush up on your financial modeling skills in order to compete for high paying investment banking jobs. Still, if you don’t mind adding a little bit of exotic flavor to your investment banking career, the sheer amount of opportunities Singapore offers will more than make up for your efforts.